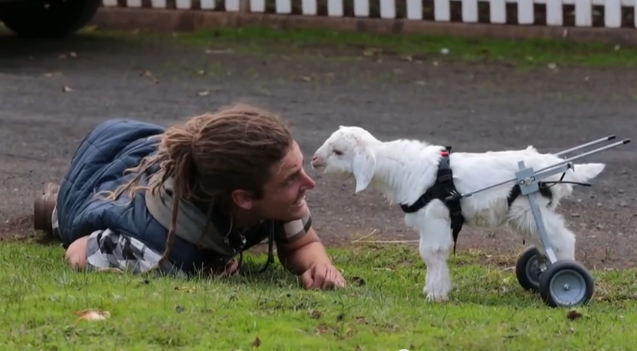 Due to a disease, Frostie, a baby goat lost his ability to fully walk. Although he can use his two front legs, the disease has incapacitated his hind legs. When he was brought to Edgar's Mission (a non-profit organization based in Australia), he was also suffering from a severe case of lice infestation and he was dehydrated. Through the care of Edgar's Mission, Frostie recovered from dehydration, treated of his lice infestation, and given a specialized wheelchair which enables him to move around. Edgar's Mission is a "not for profit organisation that seeks to create a humane and just world for humans and non-humans. " They " endeavor to achieve this by education, advocacy and empowerment." For more, visit their website or connect with them on Facebook. Here's more footage of Frostie enjoying his new set of wheels.